The Department of Communication Studies at California State University, Northridge (CSUN), offers students the chance to earn both undergraduate and graduate level degrees in communication. Located in the Northridge area in the San Fernando Valley in Los Angeles, California, CSUN has an enrollment of more than 36,000 students. 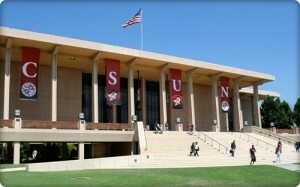 Although its roots can be traced back as far as 1952, CSUN was not officially established until 1958. It was originally set amidst the orange and walnut groves that were once the trademark of the San Fernando Valley. However, as nearby population centers grew, the 353-acre campus was gradually overtaken by suburbia. Today, the campus itself boasts one of the area’s few surviving orange groves. Another reminder of the agricultural heritage of the school is the impressive rows of eucalyptus trees that were planted by long-ago farmers to act as windbreaks for their fields. The school’s suburban setting allows for plenty of on-campus parking for students, while the proximity of more populous areas means that public transportation is a realistic option for students who do not wish to drive or maintain their own vehicles. In spite of the school’s relative youth, CSUN has been the site of many exciting events, including historic protests and demonstrations during the 1960s. The campus has also been featured in numerous television programs and movies. The CSUN undergraduate communication studies degree attempts to provide the student opportunities for hands-on learning and encourages inquiry into the importance and application of communication in an increasingly global society. The department draws upon the realm of social science to investigate the problems people face in communication and to develop solutions for them. However, CSUN recognizes that training in the ability to communicate effectively in the many contexts that exist today is still the heart of communications education. CSUN’s Master of Arts program in Communication Studies allows students the opportunity to engage in the advanced study of human communication. Graduates are prepared to enter the field of communications in either an academic or a professional capacity, or to pursue a Ph.D. in communications. The Masters program provides students the opportunity to focus on their particular areas of interest and to be involved in original research in those areas. Graduates receive a solid foundation in rhetorical studies, cultural studies, intercultural communication, performance studies, interpersonal communication, communication theory and language behavior.